Cyanobacteria have the potential to become next-generation cell factories due to their ability to use CO2, light and inorganic nutrients to produce a range of biomolecules of commercial interest. Synechococcus elongatus UTEX 2973, in particular, is a fast-growing, genetically tractable, cyanobacterium that has garnered attention as a potential biotechnological chassis. To establish this unique strain as a host for heterologous protein production, we aimed to demonstrate expression and secretion of the industrially relevant TfAA10A, a lytic polysaccharide monooxygenase from the Gram-positive bacterium Thermobifida fusca. Two variations of TfAA10A were successfully expressed in S. elongatus UTEX 2973: One containing the native N-terminal, Sec-targeted, signal peptide and a second with a Tat-targeted signal peptide from the Escherichia coli trimethylamine-N-oxide reductase (TorA). Although the TorA signal peptide correctly targeted the protein to the plasma membrane, the majority of the TorA-TfAA10A was found unprocessed in the plasma membrane with a small fraction of the mature protein ultimately translocated to the periplasm. The native Sec signal peptide allowed for efficient secretion of TfAA10A into the medium with virtually no protein being found in the cytosol, plasma membrane or periplasm. TfAA10A was demonstrated to be correctly cleaved and active on the model substrate phosphoric acid swollen cellulose. Additionally, expression and secretion only had a minor impact on cell growth. The secretion yield was estimated at 779 ± 40 µg L−1 based on densitometric analysis. To our knowledge, this is the highest secretion yield ever registered in cyanobacteria. We have shown for the first time high-titer expression and secretion of an industrially relevant and catalytically active enzyme in S. elongatus UTEX 2973. This proof-of-concept study will be valuable for the development of novel and sustainable applications in the fields of bioremediation and biocatalysis. The online version of this article ( https://doi.org/10.1186/s13068-019-1416-9) contains supplementary material, which is available to authorized users. Cyanobacteria are versatile prokaryotic photosynthetic organisms that have attracted increasing interest as sustainable chassis for future biotechnological applications. Their potential has been demonstrated for the production of a wide range of biomolecules such as isoprenoids and next-generation biofuels (see recent reviews [1, 2, 3, 4, 5, 6, 7]). Fast growth is one of the essential features for biotechnological chassis. Therefore, major efforts have been put into finding and characterizing fast-growing cyanobacteria [8, 9]. One recently described freshwater cyanobacterial strain, Synechococcus elongatus UTEX 2973, is increasingly receiving attention due to its fast growth and genetic tractability. The strain is a close relative to the model cyanobacterium Synechococcus elongatus PCC 7942. They are 99.8% identical differing only in 55 single-nucleotide polymorphisms (SNPs), a 188.6 kilo base (kb) inversion and a 7.5 kb deletion/insertion . SNPs in three specific genes, atpA, ppnK, and rpaA, enable three times higher biomass accumulation and tolerance to higher light intensities, temperature, and CO2 concentrations . A recent study has reported doubling times of 1.5 h at 1500 µmol m−2 s−1 light, 5% CO2 and 42 °C, a rate comparable to some model heterotrophs . S. elongatus UTEX 2973 has also been tested for its biotechnological potential. For example, the introduction of the sucrose transporter CscB led to a sucrose secretion rate of 35.5 mg L−1 h−1  and genome-wide transcriptomes and fluxomes have been mapped [13, 14] which will facilitate future engineering efforts. Additionally, the development of genetic tools such as CRISPR-mediated gene editing make S. elongatus UTEX 2973 a promising option for photosynthetic biotechnology [15, 16]. To develop a novel production chassis, one important aspect is to be able to express heterologous proteins at high titers and to target them to a desired intra- or extracellular location. Targeting to the outer membrane has been successfully demonstrated with several reports of surface display systems established in cyanobacteria [17, 18, 19, 20]. However, in some cases, it is useful to secrete the protein out of the cell into the culture medium. In diderm Gram-negative bacteria such as cyanobacteria, translocation of native proteins across the plasma membrane can occur via the twin arginine translocation (Tat) or the general secretion (Sec) pathways . The Sec and Tat pathways, however, can only translocate proteins to the periplasm and requires engagement with further molecular machinery to effectively translocate proteins to the extracellular environment. Therefore, throughout this article, we will refer to translocation of a protein across the plasma membrane, to the periplasm, as “export” and the active transport of a protein from the interior to the exterior of the cell as “secretion” . Although protein export and secretion pathways in cyanobacteria have been studied for almost two decades, they remain poorly understood (see recent reviews [21, 23]). Proof-of-concept studies have shown that heterologous protein secretion in cyanobacteria is possible, however, these studies have generally utilized native signal peptides fused to reporter proteins and have suffered from low yields [24, 25]. In this work, we engineered an industrially relevant extracellular enzyme, a lytic polysaccharide monooxygenase (LPMO), into the fast-growing cyanobacterium S. elongatus UTEX 2973 to assess its secretion capabilities. LPMOs are soluble, extracellular enzymes that act synergistically to boost the activity of other lignocellulosic biomass degrading enzymes [26, 27, 28]. Their active site contains a single copper ion which is coordinated by two histidine residues. Of these, the N-terminal histidine is both fully conserved and essential for activity . LPMOs can utilize O2 or H2O2 to insert one hydroxyl group into the polysaccharide chain to break the glycosidic bond. The oxidation can occur at the C1 or the C4 position and the resulting products are oxidized oligosaccharides alongside their non-oxidized counterparts. For this work, we selected the secreted LPMO TfAA10A from the Gram-positive Thermobifida fusca as our model for cyanobacterial secretion studies . 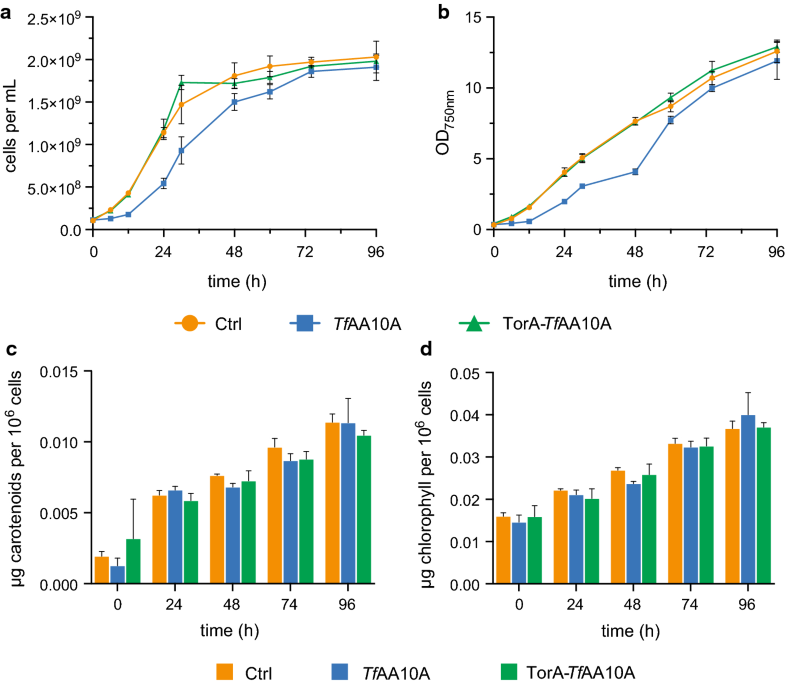 TfAA10A was expressed with its native, Sec-targeted, signal peptide and, in a different construct, with a Tat-targeted signal peptide from the Escherichia coli trimethylamine-N-oxide reductase (TorA) replacing the native signal peptide. We show that a LPMO from a Gram-positive bacterial origin can be efficiently expressed and secreted into the culture medium by S. elongatus UTEX 2973. The secreted LPMO is active on a model cellulosic substrate and only a small difference in growth was observed in the generated strains. To our knowledge, this study presents the first evidence of heterologous enzyme secretion in the novel fast-growing cyanobacterium S. elongatus UTEX 2973 which constitutes a breakthrough in cyanobacterial secretion. All generated S. elongatus UTEX 2973 strains were maintained on BG-11 medium  supplemented with 10 mM 2-tris(hydroxymethyl)-methyl-2-amino 1-ethanesulfonic acid (TES) buffer (pH 8.0) and 1.5% (w/v) bacto agar at 30 °C with continuous illumination of approximately 75 µmol photons m−2 s−1. Liquid cultures were grown in P4-TES CPH medium, a modified version of phosphate-replete (P4) medium  where the component NaHCO3 was replaced for 10 mM TES buffer (pH 8.0). Liquid cultures were grown in glass tubes at 37 °C, bubbled with 3% CO2-supplemented air and continuous illumination of approximately 150 µmol photons m−2 s−1 (if not specified otherwise). For all strains containing a plasmid, liquid cultures were supplemented with 50 µg mL−1 spectinomycin and agar plates with 100 µg mL−1 spectinomycin. If not stated otherwise, cultures were induced with 1 mM isopropyl β-d-1-thiogalactopyranoside (IPTG) for 48 h before harvesting. The full-length amino acid sequence from TfAA10A from T. fusca (Uniprot KB: Q47QG3) was codon-optimized for using GeneDesigner 2.0 . A DNA sequence encoding a C-terminal human influenza hemagglutinin (HA) epitope tag [amino acid (AA) sequence: YPYDVPDYA] was added for protein detection purposes. The DNA sequence was custom-synthesized by GenScript (USA) and inserted into the RSF1010-based, self-replicating plasmid pDF-trc , containing a synthetic widely used trc promoter for gene expression, by standard restriction digest cloning (20 µL reaction), with the restriction enzymes EcoRI and HindIII (New England Biolabs), followed by ligation with T4 DNA ligase (Roche) according to manufacturer’s instructions. The generated plasmid was named pDAR3. A second plasmid was generated by overlap extension PCR cloning  where the DNA sequence encoding the native Sec signal peptide (AA 1–36) of TfAA10A was replaced with a codon-optimized sequence of the N-terminus (AA 1–42) from trimethylamine-N-oxide reductase 1 (TorA) from E. coli (Uniprot KB: P33225). The generated plasmid was named pDAR21. All generated plasmid sequences were confirmed by Sanger sequencing. For all cloning steps, E. coli strain NEB® 5-alpha (New England Biolabs) was used for plasmid amplification. Plasmids were introduced into S. elongatus UTEX 2973 by biparental mating with an E. coli helper strain using standard procedures. In brief, chemically competent E. coli HB101 cells carrying a pRL443 helper plasmid  were transformed with the plasmid of interest. E. coli cells in exponential growth were harvested and mixed with 800 µL S. elongatus UTEX 2973 cells [optical density (OD) at 750 nm = 1]. The mixture was incubated overnight on a cellulose acetate/cellulose nitrate filter piece on a BG-11 agar plate [supplemented with 5% (v/v) lysogeny broth (LB)] at 30 °C in dim light. Cells were subsequently re-plated onto BG-11 agar plates containing 50 µg mL−1 spectinomycin and incubated in standard conditions (“Cultivation of cyanobacteria” section). After approximately 3 days, single colonies were re-streaked on agar plates containing 100 µg mL−1 spectinomycin and analyzed for the presence of the introduced plasmid by colony PCR. Colony PCR was performed using 2 µL of extracted total DNA from cyanobacterial colonies in a 25 µL standard PCR reaction with Q5 Hot-Start High-fidelity polymerase (New England Biolabs) and primers trc-F and trc-R following manufacturer’s recommendations (Additional file 1: Figure S1). DNA fragments were amplified using the following PCR conditions: 98 °C 3 min, 30 cycles of 98 °C for 2 min, 60 °C for 30 s and 72 °C for 1 min, 72 °C 1 min. For cell lysis, whole cultures were centrifuged at 4,000×g and resuspended in an appropriate volume of lysis buffer [20 mM Tris–HCl pH 7.5, 5% glycerol, 1% Triton X-100, complete protease inhibitor cocktail (Roche)]. Cells were broken with zirconium oxide beads (diameter: 0.15 mm) using a Bullet Blender Storm 24 (Next Advance) with the following settings: 3 times 5 min intervals at level 10, 12, 10. The lysates were centrifuged at 10,000×g for 10 min at 4 °C to remove cell debris and unbroken cells. The cleared lysate was transferred to a fresh tube for further analysis. All medium samples analyzed by sodium dodecyl sulfate-polyacrylamide gel electrophoresis (SDS-PAGE) and/or immunoblot were harvested by centrifugation at 10,000×g, 4 °C for 20 min and subsequently filtered with 0.45 µm PES membrane filters. Samples were then flash-frozen in liquid N2, lyophilized and stored at − 80 °C until further analysis. The periplasmic fraction of cultures was extracted following a previously described protocol  from 50 mL of an OD750 nm ≈ 4 culture. The pellet fraction (i.e. spheroplasts) was subjected to further fractionation. Spheroplasts were lysed in lysis buffer without Triton X-100 and broken as described previously (“Preparation of cleared cell lysates” section). Debris, beads and unbroken cells were collected by centrifugation at 3000×g for 5 min at 4 °C. The subsequent fractionation is based on a previously described protocol . Briefly, the lysed spheroplasts were centrifuged at 100,000×g, 4 °C for 60 min using a MLS-50 swinging-bucket rotor (Beckman Coulter). The supernatant (containing the cytosolic fraction) was collected in a separate tube and the membrane fraction was resuspended in lysis buffer. An aliquot of the total membrane fraction was kept for further analysis, the rest was loaded on a two-phase sucrose gradient [30% (w/v) and 50% (w/v)] for enrichment of the thylakoid membranes. The sucrose gradient was centrifuged for 60 min at 4 °C and 150,000×g. The thylakoid membranes were collected from the 30 to 50% sucrose interphase. Protein content of samples for SDS-PAGE was analyzed using a Pierce 660 nm protein assay reagent (Thermo Scientific) following the manufacturer’s recommendations with a standard curve from 0 to 2000 µg mL−1 bovine serum albumin. Samples were incubated for 5 min at 95 °C with sample loading buffer [containing 2% SDS and 0.1 M dithiothreitol (DTT)] prior to separation by SDS-PAGE. Proteins were separated on 12% Criterion XT bis–tris pre-cast gels (Bio-Rad Laboratories) in 2-morpholinoethanesulphonic acid (MES) running buffer at 180 V. Afterwards, the gels were either stained with Coomassie Blue, Oriole Fluorescent Gel Stain (Bio-Rad Laboratories) (protocol according to manufacturer’s instructions) or immunoblotted (see “Immunoblot analysis”). After SDS-PAGE separation, proteins were transferred onto a 0.2 µm polyvinylidene difluoride (PVDF) membrane using a Trans-Blot® Turbo transfer system (Bio-Rad Laboratories) for 7 min at 25 V. Membranes were blocked with 5% skimmed milk powder (w/v) in phosphate buffered saline with 0.05% Tween-20 (PBS-T) buffer for 60 min at room temperature and incubated in a primary antibody solution at 4 °C overnight. Various primary antibodies were used with the following dilutions: Anti-HA 1:1000 (Sigma-Aldrich), Anti-RbcL 1:5000 (Agrisera) and Anti-PsbA 1:8000 (Agrisera). The membrane was then washed with PBS-T and incubated for 60 min at room temperature with an Anti-Rabbit horseradish peroxidase (HRP)-conjugated secondary antibody (Dako) at a dilution of 1:5000. After more washing steps, the HRP signal was developed using SuperSignal West Dura Substrate (Thermo Scientific) and detected with a ChemiDoc MP imaging system (Bio-Rad Laboratories). Samples for mass spectrometry were separated by SDS-PAGE and stained with Coomassie Blue. The band of interest was excised from the gel and transferred to a de-staining solution of 50% ethanol (EtOH) and 25 mM NH4HCO3. In-gel samples were then prepared for nano-liquid chromatography/mass spectrometry/mass spectrometry (LC/MS/MS) analysis as previously described . Briefly, gel samples were reduced and cysteines alkylated with tris(2-carboxyethyl)phosphine and chloroacetamide, respectively. Peptides were generated via sequential digestion of protease lys-C and trypsin. Peptide containing samples were desalted using C18 reversed phase material prior to LC/MS/MS analysis. Proteomics analysis was performed on a Orbitrap Q-Exactive HF-X mass spectrometer (Thermo Scientific) coupled to EASY-nLC 1200 system. Peptides were injected onto an in-house packed nano-column (75 µM internal diameter and 15 cm length) packed with 1.9 µM C18 beads (Dr. Maisch GmbH). EASY-nLC 1200 was operated at 250 nL min−1 with an increasing gradient to 25% buffer B (80% acetonitrile, 0.1% formic acid). Gradient was increased to 40% in 5 min followed by a quick increase to 80% B where it was held for 2 min. Column was re-equilibrated to 5% where it was held for 5 min. The mass spectrometer was operated in positive mode using a Top15 data dependent acquisition (DDA) method. MS resolution was set to 120,000 and MS/MS fragment resolution was set to 30,000. Precursors were fragmented at a normalized collision energy (NCE) of 28 and precursors with same mass were excluded from fragmentation for 30 s thereafter. Raw data were analyzed using MaxQuant software with Andromeda search engine . Peptides and proteins were searched against the reference proteome of S. elongatus PCC 7942 with the added TfAA10A protein FASTA sequences. For densitometry, cultures were grown to an OD750 nm = 25 and induced with 1 mM IPTG for 48 h. 10 mL of cleared culture medium (OD750 nm = 28) were harvested, lyophilized and resuspended in 250 µL of 10 mM Tris–HCl buffer (pH 7.5). Five microlitre of sample were analyzed by SDS-PAGE and subsequent Oriole (Bio-Rad Laboratories) staining together with a standard curve of 50 ng, 100 ng, 150 ng and 200 ng of a commercial TfLPMO10A (NZYTech). Protein quantities were estimated using densitometric analysis with Image Lab 6.0 Software (Bio-Rad Laboratories). Growth was analyzed in a Multicultivator MC1000 (Photon Systems Instruments) in glass tubes bubbled with 3% CO2 supplemented air at 38 °C. The cultures were illuminated with a linear light gradient from 250 µmol photons m−2 s−1 to 900 µmol photons m−2 s−1 over 12 h, followed by continuous illumination with 900 µmol photons m−2 s−1. Pre-cultures were grown in the same conditions. The experimental cultures were inoculated, in triplicate, to a cell density of 1 × 108 cells mL−1 from pre-cultures and directly induced with 1 mM IPTG at timepoint 0 h. During the growth experiment, aliquots were regularly taken from the cultures to measure OD at 750 nm with a spectrophotometer, count cells using a Muse® Cell Analyzer (Merck MilliporeSigma) and to extract pigments. OD samples were diluted to OD < 1 before the measurement. Pigment content (chlorophyll and carotenoids) was estimated as described elsewhere  with slight modifications of the extraction protocol (cultures were centrifuged at 20,000×g for 10 min at 4 °C prior to and after pigment extraction). Each cell count was performed in technical triplicates and the average of these calculated. Averages of the biological replicates were calculated and the standard error is displayed (n = 3). For OD measurements and pigment extraction, one technical replicate was analyzed for all biological replicates at each shown timepoint. Means were compared using a one-way ANOVA performed in Prism (version 8.0, GraphPad Software). TfAA10A was purified from the culture medium of a 1 L late log phase culture. Cells were harvested at 10,000×g, 4 °C for 20 min. Complete protease inhibitor cocktail (Roche) was added to the cell-free medium (1 tablet per 100 mL) and, subsequently, the medium was filtered with a 0.45 µm PES membrane filter. The medium was loaded onto a 10-mL Q-Sepharose column (Q-Sepharose Fast Flow, GE Healthcare) which was washed in 20 mM HEPES pH 7.2, 5% glycerol, 1 mM MgCl2 and 5 mM DTT. DTT is a known LPMO reducing agent, therefore, when possible, should be avoided to prevent protein damage during purification. TfAA10A was eluted using two column volumes of the same buffer containing 150 and 200 mM NaCl. All elution fractions were concentrated using Vivaspin 20 centrifugal concentrators with a 10 kDa molecular weight cut-off (GE Healthcare) and subjected to affinity chromatography using 100 µL Pierce Anti-HA Agarose resin (Thermo Scientific) according to the manufacturer’s protocol. TfAA10A was eluted with 10 mM Tris–HCl buffer (pH 7.5) and 3.5 M MgCl2, and desalted with Micro Bio-Spin 6 columns pre-hydrated with 10 mM Tris–HCl buffer (pH 7.5) (Bio-Rad Laboratories). Purity was confirmed by SDS-PAGE and immunoblotting. Copper reconstitution of the purified TfAA10A was done by incubating the protein with CuCl2, in a 1:2 molar ratio (TfAA10A:CuCl2) at 4 °C overnight. Excess CuCl2 buffer was removed with Micro Bio-Spin 6 desalting columns pre-hydrated with 10 mM Tris–HCl buffer (pH 7.5) (Bio-Rad Laboratories). The reconstituted protein was then used for the activity assays described in the next sections. The Amplex red assay  was performed on a SpectraMax M2 multi-detection microplate reader using a black 96-well plate with clear bottom (Thermo Scientific). All the reactions were performed in 20 mM sodium phosphate buffer, pH 6.0 at 37 °C. 200 µL of reaction mixture contained 100 µM EDTA (10 mM stock), 80 µM ascorbate (1 mM stock), 50 µM Ampliflu red (5 mM stock), 20 U mL−1 HRP (300 U mL−1 stock) and 1 µg purified and reconstituted TfAA10A. The negative control omitted the enzyme. The buffer control contained only 20 mM sodium phosphate buffer, pH 6.0. Resorufin fluorescence was recorded with an excitation and emission wavelength of 557 nm and 583 nm, respectively. Fluorescence was measured from the bottom for 10 min with 5 s initial shaking. Averages of the replicates were calculated and the standard error is displayed (n = 3). Means were compared using a one-way ANOVA performed in Prism (version 8.0, GraphPad Software). Phosphoric acid swollen cellulose (PASC) substrate was prepared by treating Avicel (Merck MilliporeSigma), a crystalline cellulose, with phosphoric acid as previously described . Briefly, 4 g of Avicel was dispersed into 100 mL of phosphoric acid (86% w/v) at 60 °C and magnetically stirred for an hour. 1900 mL H2O was slowly dripped into the solution while stirring. The suspension was then incubated at 4 °C for sedimentation. After sedimentation, the supernatant was removed, the suspension was washed four times with H2O and the pH was neutralized using Na2CO3. TfAA10A catalyzed oxidation of PASC was performed in 50 mM phosphate buffer (pH 7.5). All reaction mixtures contained 2 mM ascorbate, 0.75% w/v PASC and 2 µg purified and reconstituted TfAA10A. The negative control omitted the enzyme. Reactions were carried out at 50 °C for 24 h. Reactions were stopped by boiling the samples in the presence of 1 mM EDTA. Samples were then filtered with a 0.45 µM PES membrane filter and analyzed by high-performance anion exchange chromatography (HPAEC). HPAEC analysis of the released oligosaccharides from the cellulosic substrate was performed on an ICS-5000+ system, equipped with a PAD detector (Thermo Scientific), with a CarboPac PA1 column (two 2 × 50 mm guard columns followed by a 2 × 250 mm analytical column), and operated at 0.25 mL min−1 and 30 °C. The chromatographic separation of aldonic acids was carried out as previously described . For the elution the following gradient was applied (Eluent A: 0.1 M NaOH; Eluent B: 1 M NaOAc in 0.1 M NaOH): 100% A:0% B to 90% A:10% B (10 min), then to 83.1% A:16.9% B (25 min) and lastly 0% A:100% B (30 min). For reconditioning of the column 100% A:0% B was applied for 15 min (35–50 min). The cello-oligosaccharide peaks were assigned according to elution profiles of synthesized oxidized oligosaccharide standards (DP2ox–DP6ox), commercially available native oligosaccharides (DP3–DP6) and based on inferences from previous studies [45, 46]. The oxidized oligosaccharide standards (DP2ox–DP6ox) were synthesized by the iodine oxidation method modified from previous studies [47, 48]. Thermobifida fusca is a model cellulolytic bacterium which secretes two LPMOs: the 22.7 kDa single-domain TfAA10A (formerly E7) and the 44.7 kDa three-domain TfAA10B (formerly E8) . The activity of TfAA10A is well characterized and its X-ray structure has been described. It is commercially available and is now considered a model enzyme for cellulose degradation in bacteria [45, 49, 50]. Therefore, for this study, we chose the T. fusca LPMO AA10A (TfAA10A) for expression in S. elongatus UTEX 2973. A custom-synthesized and codon-optimized DNA sequence encoding the full length TfAA10A protein fused to a C-terminal HA epitope tag was inserted into the multiple cloning site of the self-replicating broad-host-range pDF-trc expression vector . In the absence of a TfAA10A specific antibody, the HA epitope tag allowed for detection of the protein. The generated plasmid was termed pDAR3. Additionally, a second construct was generated where the DNA sequence encoding the native TfAA10A N-terminal Sec signal peptide (AA residues 1–36) was replaced with the N-terminal signal peptide of the E. coli trimethylamine N-oxide reductase (TorA) which is a known model Tat pathway signal peptide. This second plasmid was named pDAR21 (Fig. 1a). To generate the modified cyanobacterial strains, the plasmids pDAR3, pDAR21 and pDF-trc [control plasmid without a gene of interest (GOI)] were conjugated into S. elongatus UTEX 2973 using biparental mating with an E. coli helper strain. The generated strains were selected on spectinomycin-containing growth medium. Single colonies (up to 5 per construct) were analyzed by PCR for the presence of the GOI (Additional file 1: Figure S1) to confirm successful transformation. The generated S. elongatus UTEX 2973 strains were named TfAA10A (transformed with pDAR3 plasmid) and TorA-TfAA10A (transformed with pDAR21 plasmid) (Fig. 1a). The S. elongatus UTEX 2973 strain containing the pDF-trc plasmid without a GOI will be referred to as “Ctrl”. Two independent colonies from each transformant, confirmed to contain the respective GOI, were subjected to immunoblot analysis to screen for expression of the TfAA10A protein (Fig. 1b, c). 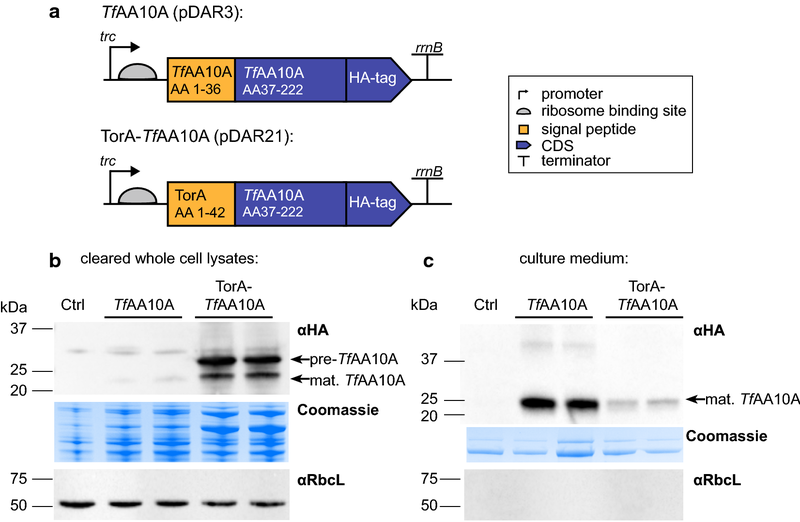 To determine the location of TfAA10A, the cleared cellular lysates and cell-free culture medium were analyzed separately with an anti-HA antibody (Fig. 1b, c). The expected size of the mature TfAA10A, together with the C-terminal HA tag, is 22.4 kDa. In the cellular lysates of the TfAA10A strain, only trace amounts of mature protein were found and the pre-protein could not be detected. In contrast, in the TorA-TfAA10A strain, both the pre-protein and the mature form were found in the cellular lysate (Fig. 1b). In the culture medium of the TfAA10A strain, the mature protein was found at the expected size, however, only a small amount of mature protein was detected in the medium of the TorA-TfAA10A strain (Fig. 1c). To verify if the presence of the protein in the medium of both strains was due to active secretion rather than cell lysis, medium samples were also immunoblotted with an anti-RbcL antibody. The large subunit of ribulose-1,5-bisphosphate carboxylase/oxygenase (RbcL) could only be detected in the cellular lysates (Fig. 1b) whereas no protein was found in the medium (Fig. 1c). These results suggested that the LPMO was efficiently translocated across both membranes in the TfAA10A strain but that this was not the case in the TorA-TfAA10A strain. To determine where the TfAA10A protein was accumulating within the cell, cultures of each strain were fractionated into spheroplasts and periplasm (Fig. 2). Confirming what was previously observed (Fig. 1b, c), very little protein accumulated intracellularly in the TfAA10A strain. However, in the TorA-TfAA10A strain, both the pre-protein and mature TfAA10A were found in large amounts in the spheroplasts and some processed (mature) TfAA10A was detected in the periplasmic fraction (Fig. 2). To determine the subcellular localization of TfAA10A protein accumulation more precisely, spheroplasts were further fractionated into cytosol (soluble fraction), total membranes/insoluble fraction and thylakoid enriched membranes (Fig. 3). Separation of the individual fractions by SDS-PAGE showed that the most prominent band found in the total membrane fraction of the TorA-TfAA10A strain, matched the predicted size of unprocessed TorA-TfAA10A (26.8 kDa) (Fig. 3a, marked with an asterisk). The band was much less abundant in the thylakoid enriched fraction of TorA-TfAA10A suggesting that the majority of the protein is localized to the plasma membrane (Fig. 3a, b). The identity of the band was confirmed as unprocessed TorA-TfAA10A by fingerprint mass spectrometry (Additional file 1: Figure S2). Herewith, it became apparent that the TorA-TfAA10A strain was unable to efficiently secrete TfAA10A. However, in the TfAA10A strain we observed only small amounts of the LPMO in the membrane fractions and the periplasm suggesting more efficient secretion of the protein (Fig. 3b). Therefore, we proceeded to characterize the secretion ability of the TfAA10A strain in more detail. To assess correct processing of the signal peptide and secretion yields, the protein from the TfAA10A strain was harvested from the culture medium and concentrated for further analysis. SDS-PAGE analysis of the medium suggested that the secreted TfAA10A was processed correctly as the observed protein size matched the expected size of the mature protein (Figs. 1c, 2, 3). To further confirm this observation, the protein was analyzed by cutting out the band from an SDS-PAGE gel and subsequent mass spectrometry fingerprint analysis (Additional file 1: Figure S3). The mature N-terminal tryptic peptide was identified and furthermore, no evidence of the TfAA10A signal peptide was found. This suggests the secreted protein was efficiently processed. We then proceeded to determine secretion yields by densitometric analysis utilizing a fluorescent gel stain and a commercially available TfAA10A of known concentration for a standard curve (Additional file 1: Figure S4). Based on the densitometric analysis of absolute protein abundance, protein yields were estimated to be 779 ± 40 µg L−1. To determine if the secreted protein was active, the purified and copper reconstituted TfAA10A was initially tested for activity using the Amplex red assay. This coupled assay measures the generation of hydrogen peroxide, a futile oxygen-reducing reaction of the LPMO in the absence of a substrate . Samples of the cyanobacterial TfAA10A showed a significantly stronger increase in fluorescence intensity compared to the control samples (p < 0.001) (Fig. 4a). 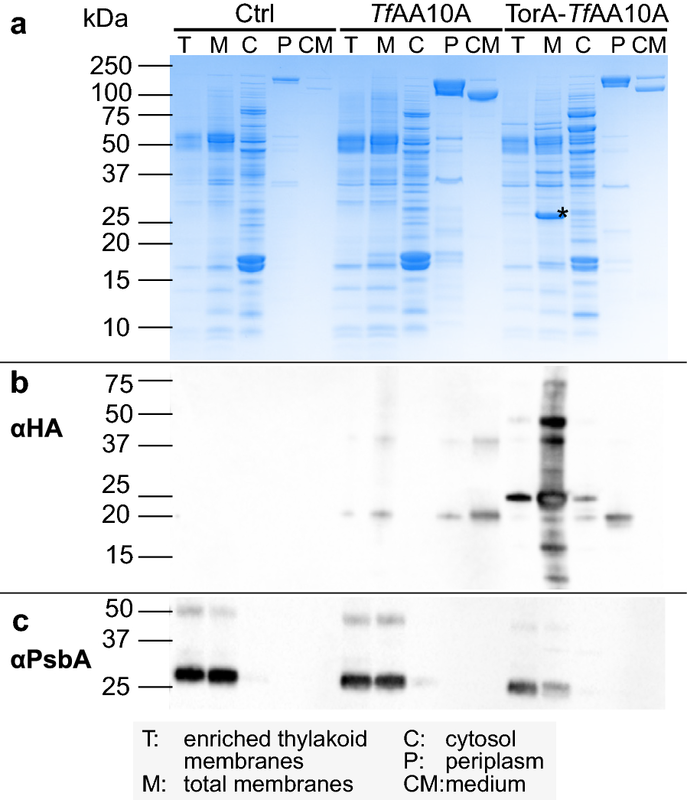 Then, to confirm that the cyanobacterial TfAA10A was catalytically active, we incubated the protein with the model substrate PASC and ascorbic acid and measured the released oligosaccharides by high-performance anion exchange chromatography (HPAEC) (Fig. 4b). The chromatograms obtained from the enzymatic assay were compared to a set of synthesized oxidized oligosaccharide standards (DP2ox–DP6ox) and commercially available non-oxidized (i.e. native) oligosaccharides (DP3–DP6). The oxidized peaks, and native counterparts, matched a substrate oxidation pattern typical for C1-oxidizing LPMOs (Fig. 4b). As both TfAA10A and TorA-TfAA10A strains successfully expressed the heterologous TfAA10A, we wanted to determine the metabolic impact of heterologous LPMO expression on the cyanobacterial transformants. Therefore, we analyzed growth (cell numbers and optical density) and pigment content (chlorophyll and carotenoids), over the course of 96 h, in the two LPMO strains and an empty vector control strain (Fig. 5). In the initial 12 h of the experiment, the TfAA10A strain presented slower growth and, consequently, lower cell numbers throughout the experiment, however, after 72 h there was no significant difference between the three strains (p = 0.722) (Fig. 5a, b). Chlorophyll and carotenoid values, normalized to cell number, showed that there were no significant differences in chlorophyll (p = 0.947) or carotenoid (p = 0.915) amounts across the three strains (Fig. 5c, d). In this study, we have successfully expressed and secreted the T. fusca LPMO TfAA10A in the fast-growing cyanobacterium S. elongatus UTEX 2973. Two different strains were generated for this study—one strain expressing the native TfAA10A sequence with its N-terminal Sec signal peptide and a second strain which has the native N-terminal signal peptide replaced by the TorA signal peptide, a model signal peptide for Tat translocation studies. The native TfAA10A was efficiently secreted to the medium with virtually no protein found in the cellular lysates. However, the Tat-targeted TorA-TfAA10A was mostly found unprocessed, and degraded, in the plasma membrane. The Tat pathway has the particularity of translocating fully folded proteins with an inbuilt “proof-reading” system capable of rejecting misfolded or cofactor-lacking substrates [52, 53, 54]. In bacteria, the Tat pathway is mainly used for the translocation of complex cofactor-containing redox enzymes into the periplasm and the extracellular space [55, 56]. Therefore, we hypothesized that Tat-mediated secretion could potentially be advantageous for the copper cofactor-containing TfAA10A. In Fig. 3 we show that the majority of the protein is correctly targeted to the plasma membrane and to the periplasm (rather than into the thylakoid lumen). This is in line with previous reports that show TorA-GFP expression in the model cyanobacterium Synechocystis PCC 6803 led to GFP accumulation in the periplasm rather than the thylakoid lumen . However, TorA-TfAA10A mostly accumulated unprocessed in the plasma membrane with only a minor fraction being translocated to the periplasm. While the exact reason for this is not clear, we can speculate that if the protein cannot fold correctly in the cytoplasmic environment, or if the copper cofactor is not adequately incorporated, it may not be translocated by the Tat machinery. As we have only tested the TorA signal peptide, we cannot rule out that our observations are specific to this signal peptide in S. elongatus UTEX 2973. Other Tat-targeting signal peptides may be able to improve secretion with the cyanobacterial Tat system. In the Gram-positive bacterium T. fusca, TfAA10A is secreted unfolded through the Sec pathway. Due to the single membrane architecture of this bacterium, the protein is translocated directly to the extracellular environment . Therefore, we were interested in testing if the Gram-negative cyanobacterial secretion system could recognize and secrete a heterologous protein of Gram-positive origin. Our initial results demonstrated that TfAA10A secretion was indeed extremely efficient and virtually all the protein was translocated into the culture medium. Translocation across the plasma membrane, i.e. export to the periplasm, is likely to be mediated by the Sec pathway. The Sec pathway is conserved across the bacterial kingdom  and both T. fusca and S. elongatus UTEX 2973 have a complete set of genes encoding the different Sec components [59, 60]. However, we can only speculate on the precise manner through which the protein is sorted in the periplasm and translocated across the outer membrane. Secretion in cyanobacteria is poorly characterized, however, two potential routes are known: a one-step, Sec or Tat independent, cytoplasm-to-medium route and a two-step periplasmic route that relies on Sec or Tat to mediate translocation across the plasma membrane and requires the engagement of additional components for translocation across the outer membrane . Genome-wide bioinformatics analysis have identified both secretion systems in S. elongatus PCC 7942: the one-step type I secretion system (T1SS) and the two-step type IV pilus (T4P) assembly system . Apart from a point mutation in the T4P protein PilN, the T4P system in S. elongatus UTEX 2973 seems to be identical to S. elongatus PCC 7942 . Therefore, the presence of Sec or Tat targeting signal peptides in our different constructs suggest that secretion is more likely to be mediated by the two-step T4P cyanobacterial secretion system. Precise cleavage of LPMO signal peptides is of utmost importance due to the fact that the N-terminal histidine of the mature protein coordinates the active site copper ion . Therefore, it was crucial to demonstrate that the secreted enzyme was catalytically active. The secreted TfAA10A was first tested with an Amplex red assay which suggested the enzyme was active. We proceeded to test the activity of TfAA10A on the model LPMO substrate PASC. The activity chromatogram showed a clear C1 oxidation profile leading us to conclude that the signal peptide was processed correctly during secretion. To achieve high-titer secretion, we took advantage of the fast-growth of S. elongatus UTEX 2973 under high-light and elevated CO2 levels. After 5 days of growth an OD750 of 25 was achieved and the culture was induced. Culture induction was done in the stationary phase because existing secretion literature supports the hypothesis that a slower translation rate can improve protein folding and translocation yields . After harvesting, densitometric analysis indicated a TfAA10A yield of 779 ± 40 µg L−1 in the culture medium without further optimization (Additional file 1: Figure S4). Although the lack of quantification data in other cyanobacterial secretion studies hinders widespread comparisons, to our knowledge, this is the highest yield reported to date for the secretion of a heterologous enzyme in cyanobacteria [24, 25, 63]. Although our reported yield of secreted LPMO is approximately 25% of previously reported yields for E. coli TfAA10A expression (3 mg L−1), the majority of TfAA10A in E. coli was exported to the periplasm , whereas the S. elongatus UTEX 2973 TfAA10A was fully secreted to the medium. 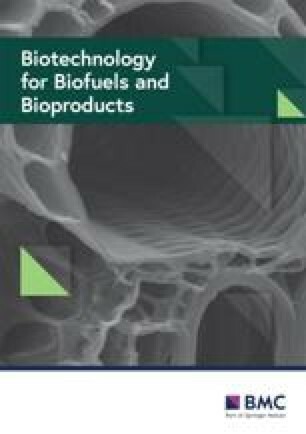 The combination of high expression and low impact on cell growth and final biomass levels suggests promising potential for further optimization and biotechnological exploitation. Previous studies have suggested that cyanobacterial secretion of heterologous proteins may have applications in microcystin degradation , heavy metal bioremediation  and CO2 sequestration . We believe this can also be extended to whole-cell biocatalysis where cyanobacteria have the potential to become light-driven cell factories capable of secreting active enzymes to sustain extracellular biotransformations. We have demonstrated for the first time that S. elongatus UTEX 2973 is capable of high-titer secretion of a heterologous and industrially relevant enzyme. Although S. elongatus UTEX 2973 is a relatively new organism to be characterized for biotechnological applications, it is likely to become a popular option among cyanobacteria due to its properties of fast-growth, environmental resistance and genetic tractability. Additionally, by demonstrating that protein secretion can be achieved with a Gram-positive signal peptide, we have dramatically expanded the library of potential signal peptides for cyanobacterial applications. Establishing robust systems of heterologous enzyme secretion in cyanobacteria is an important step towards the development of light-driven applications in bioremediation and whole-cell biocatalysis. DAR, JAZZ and PEJ designed the study and analyzed the data. DAR, JAZZ and DNW designed and performed the experiments. BM and RKS performed the activity assays. TSB performed the mass spectrometry analyses. DAR and JAZZ drafted the manuscript with contributions from BM, RKS, TBS, BvO, JVO, MJB and PEJ. All authors read and approved the final manuscript. The authors thank Cory J. Knoot and Himadri Pakrasi for kindly donating the Synechococcus elongatus UTEX 2973 strain, Malene B. Keller for synthesizing the oxidized oligosaccharides and Claus Felby for critical reading of the manuscript. The datasets used and/or analyzed during the current study are available from the corresponding authors on reasonable request. This work was supported by the Copenhagen Plant Science Centre, the VILLUM Foundation “Light-driven biosynthesis: Improving photosynthesis by designing and exploring novel electron transfer pathways” (Project No. 13363), the Novo Nordisk Foundation project “Harnessing the Energy of the Sun for Biomass Conversion” (NNF16OC0021832), the Novo Nordisk Foundation project “HOPE—Harnessing the oxidative power of enzymes” (NNF17SA0027704) and the project “Cynthetica” from the European Union’s Horizon 2020 research and innovation programme under the Marie Sklodowska-Curie Grant Agreement No. 745959. Work at The Novo Nordisk Foundation Center for Protein Research (CPR) is funded in part by a generous donation from the Novo Nordisk Foundation (Grant number NNF14CC0001). Additional file 1: Figure S1. PCR analysis of S. elongatus UTEX 2973 strains TfAA10A (pDAR3) and TorA-TfAA10A (pDAR21). Figure S2. 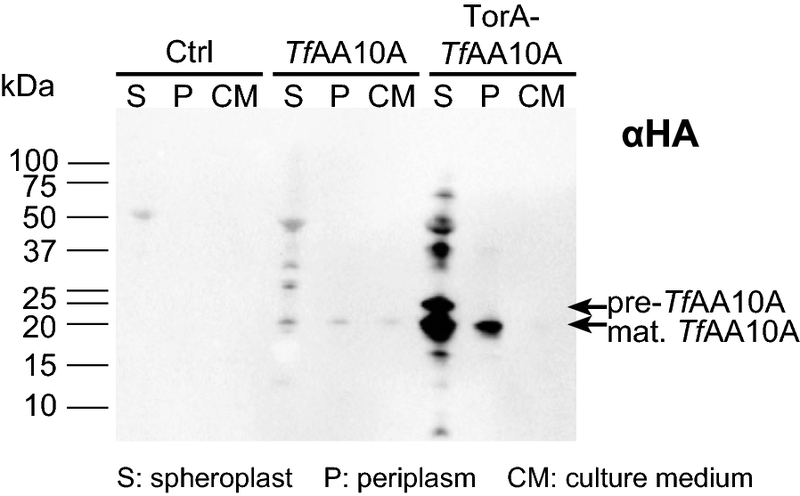 Identification of the TorA signal peptide in the pre-protein TorA-TfAA10A, found in the plasma membrane fraction, by mass spectrometry. Figure S3. Identification of the secreted TfAA10A by mass spectrometry. Figure S4. Densitometric analysis of secreted TfAA10A. Figure S5. PASC oxidation by TfAA10A. Corbett HM, Thompson NS, Malcolm EW. Study of the carbohydrate peeling and stopping reactions under the conditions of oxygen-alkali pulping, Project 3265, Report Four: a final report to members of the Institute of Paper Chemistry. Appleton, Wisconsin: The Institute of Paper Chemistry; 1979. https://smartech.gatech.edu/handle/1853/823. Accessed 11 Mar 2019.